Roses are one of the most commonly grown flowering plants around the globe. They are prized for their wide variety of growing habits and showy flowers. Germinating rose seeds is a relatively easy process once you interrupt the dormancy of the seeds. However, keep in mind that growing roses from seed will not produce the same variety of rose from which you harvested the seeds. Harvest rose hips in late summer through early fall but before they become soft. You will know they are ready for harvesting when they turn a bright orange-red. 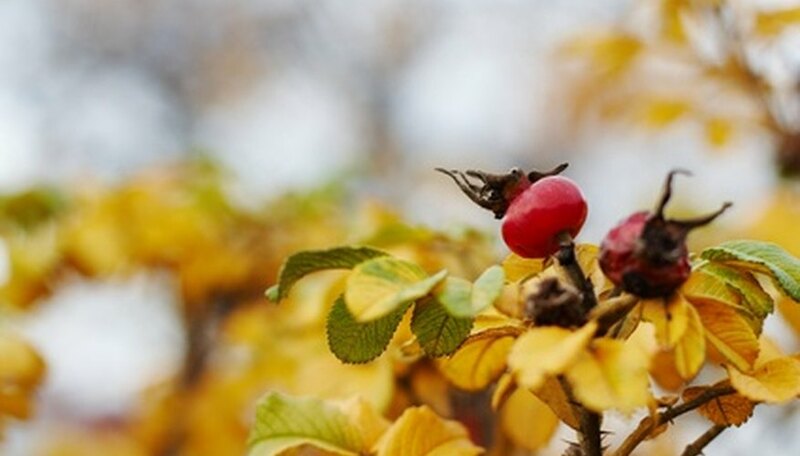 Place the rose hips into a bowl that contains about 2 inches of water. Let the hips soak in the water for no more than two days. This helps to soften them up and makes extracting the seeds easier. Cut open the hips using a sharp knife. Extract the rose seeds from each of the hips. Fill up a glass with water. Add 1 tsp. of household bleach to the glass of water. Place the rose seeds into the glass and let them soak for one to two hours. Discard any seeds that float since they will most likely not be viable. Measure 1 to 1 1/2 cups of fine sand or vermiculite. Place the sand or vermiculite into a zipper-top plastic bag. Pour about 1 cup of water into the plastic bag until the sand or vermiculite feels damp to the touch. Place the rose seeds into the sand or vermiculite and seal the bag. Put the bag into a refrigerator where the temperature is set to 40 degrees F. Check on the bag twice a week and spritz the sand or vermiculite with water as often as needed to keep it moist. The bag will remain in the cold storage for four months. Remove the bag from its cold storage after the allotted time has passed. Place the sand or vermiculite and seed mixture into a fine wire basket or sieve to separate the seeds from the sand. Plant the seeds once you have separated them all from the sand or vermiculite. Fill 3- or 4-inch plastic pots with a good quality sterilized seed raising planting mix. Seed raising planting mix is a finely sifted soil that is made especially for sprouting seeds. Firm the seed raising mix down in the pots using the base of a 2-inch pot, your fingers or a small block of wood. Place the pots into a watering tray or other similar container. You will use the tray for watering, so it should not contain any holes. Place two rose seeds on the surface of the mix in each pot. Sprinkle 1/4 inch of the seed raising mix over each of the rose seeds. Transfer the tray containing the pots to a moderately warm area in your home that will also provide as much indirect light as possible. Near a south- or west-facing window is ideal. The mix should be kept moist, but do not over-water so it becomes sodden wet. Add 1 to 2 cups of water to the tray at a time when needed. The rose seeds should begin sprouting in approximately three to four weeks, but may require longer.